Aquaclean Silicon Free Car Polish is a super high gloss car polish based solely on carnauba wax. This product is free from all silicones & silicone resins. It is safe to use in workshops where paint spraying is carried out. It is easy & quick to apply and allows a car to be polished from front to back in around 20 minutes. 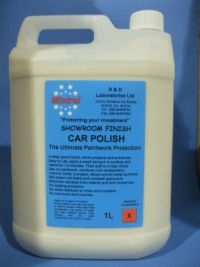 Specially formulated without the need for powders it eliminates the problems of white bumpers & trims normally associated with conventional polishes. In fact it was designed to be used on all external surfaces - paintwork, bumpers, trims, glass, chrome, plastic, etc. You will be amazed, not only, at the depth of shine but also how long it lasts. Polishing should be painless, so no more sore arms & muscles. No more... having to apply & leave for 1 hour, then buff off, no more having to remove the white resides left on the trims. Simply apply to a panel, spread evenly, leave for a few seconds & polish to a high shine.